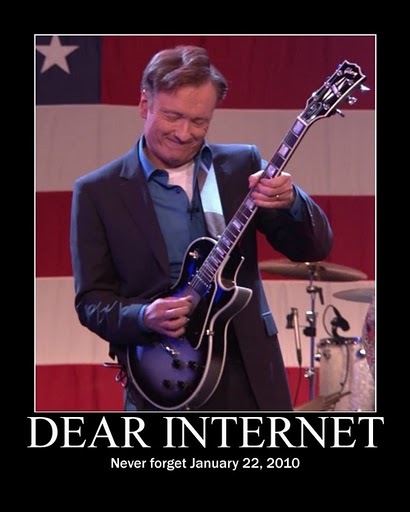 Last night, Conan O'Brien hosted his last Tonight Show. I'm with Coco, and not just because I attended the taping of his show. I like that guy for a whole bunch of reasons. It is really too bad the NBC royally f"cked this whole thing up. Speaking of NBC, they blocked the video. This would have been awesome had Will Ferrell not absolutely ruined it with his over the topness. Agree about Ferrell, the bit was good but it seemed like Will was almost trying to steal the spotlight. I'm sure he meant well. That was awesome!!! Perfect ending in my opinion. 3) Up yours twice, NBC. You wrote a few days ago that you weren't watching Conon in his new time slot so apparently you're just jumping on the bandwagon now. I was there at the beginning. Every night. I lined up for hours in the freezing cold to see him in Toronto. Ask my bros - this is no bandwagon jumping.